Seventh Day in the Octave of Christmas: "Children, it is the last hour"
... just as you heard that the antichrist was coming, so now many antichrists have appeared. 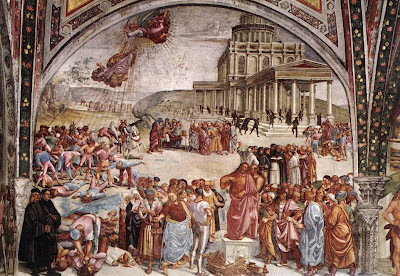 Art: Luca Signorelli, Sermon and Deeds of the Antichrist, Orvieto. Sixth Day in the Christmas Octave: "Do not love the world"
Fifth Day in the Christmas Octave: "keep his commandments"
"A murderer from the beginning, . . . a liar and the father of lies," Satan is "the deceiver of the whole world." Through him sin and death entered the world and by his definitive defeat all creation will be "freed from the corruption of sin and death." Now "we know that anyone born of God does not sin, but He who was born of God keeps him, and the evil one does not touch him. We know that we are of God, and the whole world is in the power of the evil one." The Lord who has taken away your sin and pardoned your faults also protects you and keeps you from the wiles of your adversary the devil, so that the enemy, who is accustomed to leading into sin, may not surprise you. One who entrusts himself to God does not dread the devil. "If God is for us, who is against us?" Feast of the Holy Family: "I must be in my Father's house"
In these days following our Lord's birth, we contemplate the mysteries of his hidden life at Nazareth. 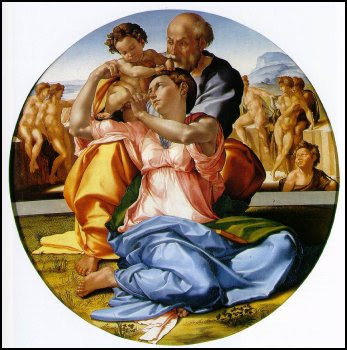 Art: The Holy Family by Michelangelo. Christmas Day: " In the beginning was the Word"
... and the Word was with God, and the Word was God. He was in the beginning with God. All things came to be through him, and without him nothing came to be. "In the beginning was the Word. . . and the Word was God. . . all things were made through him, and without him was not anything made that was made." The New Testament reveals that God created everything by the eternal Word, his beloved Son. In him "all things were created, in heaven and on earth.. . all things were created through him and for him. He is before all things, and in him all things hold together." The Church's faith likewise confesses the creative action of the Holy Spirit, the "giver of life", "the Creator Spirit" (Veni, Creator Spiritus), the "source of every good". 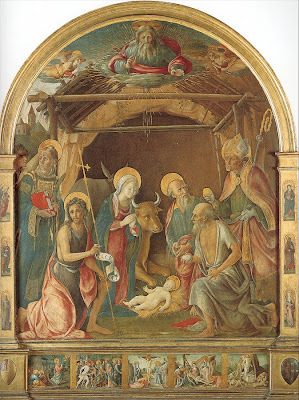 Art: Pietro Orioli, 1458 - 1496, Nativity with Saints. National Gallery, London. 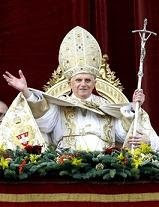 For the MCITL reflection on the Scriptures for the Mass of Christmas Day, please click here. Christ is born today! Hodie Christus natus est! Grateful thanks and very best wishes to all visitors and friends for a most blessed and joy-filled Christ-MASS from MCITL. Photo: Neapolitan presepe by MCITL. Christmas Eve: "For the LORD delights in you"
God's love for Israel is compared to a father's love for his son. His love for his people is stronger than a mother's for her children. God loves his people more than a bridegroom his beloved; his love will be victorious over even the worst infidelities and will extend to his most precious gift: "God so loved the world that he gave his only Son." 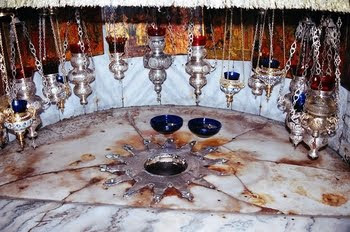 Photo: Birthplace of Jesus Christ our Lord in the cave of Bethlehem. Wednesday, Advent Wk III: "Are you the one who is to come?" The authority required by the moral order derives from God: "Let every person be subject to the governing authorities. For there is no authority except from God, and those that exist have been instituted by God. Therefore he who resists the authorities resists what God has appointed, and those who resist will incur judgment." 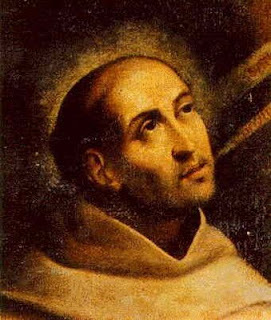 Image: Saint John of the Cross. Source: Wikipedia. 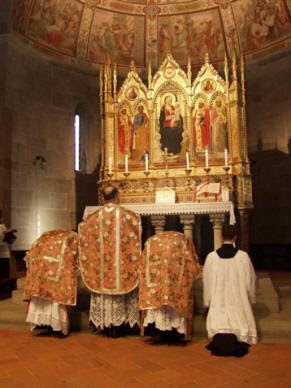 "Gaudete in Domino semper: iterum dico, gaudete. Rejoice in the Lord always. Again, I say rejoice." What kind of rejoicing can come from hearing St. John's description of the coming of the Messiah? "...he will baptize you with the Holy Spirit and with fire. His winnowing fork is in his hand, to clear his threshing floor, and to gather the wheat into his granary, but the chaff he will burn with unquenchable fire. "(Jn 3: 16-17) And yet, St. Luke tells us we are to welcome this news as good: "So with other exhortations, he preached good news to the people." (Jn 3: 18) John's preaching about the judgment, that some souls might be lost, can hardly be considered "good news"; unless it is the truth. The truth, however difficult though it may be for us to hear, is always good news. St. John lays bare the truth about the sins of the people, the tax collectors and the soldiers, instructing them as to how to correct their lives. This is good news, though painful to hear, for it will bring repentance, conversion and healing. Rejoicing will follow, for those who amend their lives enjoy God's mercy unto everlasting life. It is the truth which is the "Good News". Today on Gaudete, or "rejoice", Sunday we remember that though our lives are marked by waiting and watching, by penance and prayer, we are yet people of joy. Our joy is a gift and fruit of the Holy Spirit, given to us in fullest measure, that we may love God. "The love of God has been poured into our hearts by the Holy Spirit who has been given to us." Joy is not possible unless one receives the Spirit's gift of divine charity. We rejoice because we are secure in the knowledge of the love of God who has truly revealed himself as our Father through the gift of his only-begotten Son at Bethlehem. St. John foretells the coming of the Incarnate God who is Judge and Lord. The people, stricken with fear at St. John's message, ask him, "What are we to do?" He instructs them to live in charity: give a coat to him who has none, share your food, act with justice. These are the fruits of the virtue of charity. Heaven, the union of all the saints and holy angels with the Triune God, is the only place of unending and complete joy. Hope of heaven, together with faith and charity, are the virtues by which the Holy Spirit enables us to rejoice with authentic joy flowing from and leading toward the Trinity. 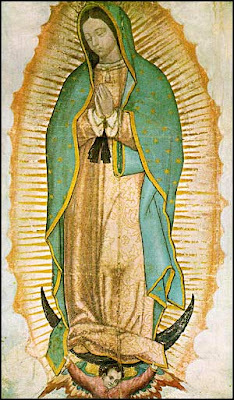 Our Lady of Guadalupe: "Rejoice, O daughter Zion!" The Holy Spirit prepared Mary by his grace. It was fitting that the mother of him in whom "the whole fullness of deity dwells bodily" should herself be "full of grace." She was, by sheer grace, conceived without sin as the most humble of creatures, the most capable of welcoming the inexpressible gift of the Almighty. It was quite correct for the angel Gabriel to greet her as the "Daughter of Zion": "Rejoice." It is the thanksgiving of the whole People of God, and thus of the Church, which Mary in her canticle lifts up to the Father in the Holy Spirit while carrying within her the eternal Son. Photo: The tilma of Saint Juan Diego with the image of Our Lady of Guadalupe. Friday, Advent Wk II: "this generation ... is like children"
Thursday, Advent Wk II: "none greater than John the Baptist"
yet the least in the Kingdom of heaven is greater than he... And if you are willing to accept it, he is Elijah, the one who is to come. 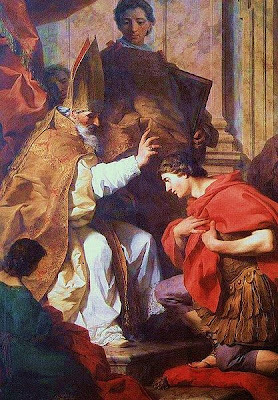 Art: Ambrose converting Theodosius, Pierre Subleyras,1699-1749. S. Ambrose is a patron of Meeting Christ in the Liturgy, with his words providing the inspiration for this project: "I see you, O Lord, face to face; I meet you in your sacraments."